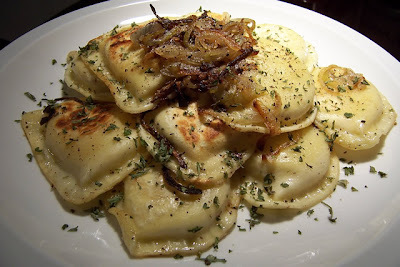 Chalk it up to my partial Eastern European heritage, but I enjoy a good pierogi every once in a while. There are two ways to get your pierogi. 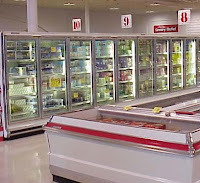 You can either find yourself a babcia (that's "Grandmother" in Polish for you playing the home game), or you can check the freezer case of your local grocery store. Hint: Babcias are hard to find some times. Grocery stores are easier. Prepare your frozen pierogi as printed on the side of the bag. This usually involves bringing a large pot of salted water to a boil, and then putting the pierogi in for a 4 minute swim, before scooping them out to an awaiting strainer. WHAT?!? YOU DON'T HAVE ONE?!? Okay, that's cool, we'll wait until you run down to your local Gander Mountain or Cracker Barrel, and pick yourself up a 12" Lodge Logic (preseasoned) skillet. Go on, we'll wait. Don't speed. Buckle up. Put it over medium heat and sweat the onion in the butter with a sprinkle of kosher salt. 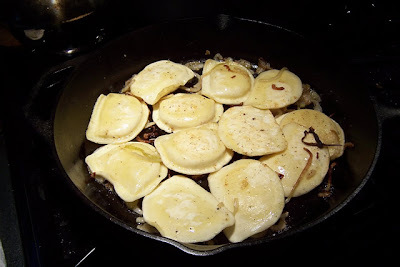 Once the onions start to get translucent, slowly place your pierogi in the skillet, but don't overcrowd. 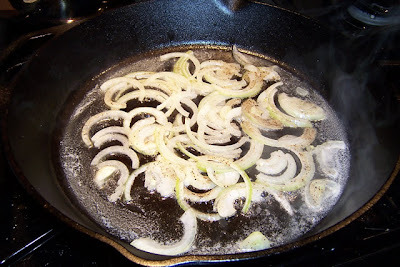 If you have a smaller skillet, fry them in batches. Allow the pierogi to brown nicely for few minutes before carefully turning them over to let the otherside brown. Some like to add a dollop of sour cream, I say let the pieorgi speak for themselves... okay, maybe some parsley... and chives. Now I'm not saying that you shouldn't try to form your own pierogi, and who knows, we may do this here someday... I'm just saying that pierogi can be a quick and easy addition to any meal... one Babcia would be proud of... right Grandma? Those pierogies looks amazing. A polish friend of ours made a whole pile of pierogies for us a while back. This is absolutely something I need to put on my list of things to make soon. 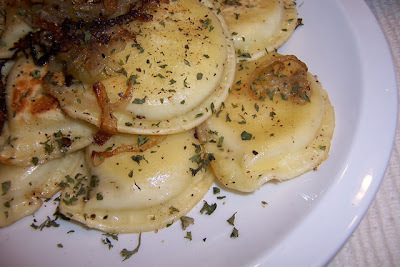 after reading this article I still have the problem of what to serve with these wonderful perogies. Really there should be some other foods at the table, I just don't know what. Help please. Rice Pilaf, Butter and Herb Rice, or Risotto, are all great combinations with this dish.